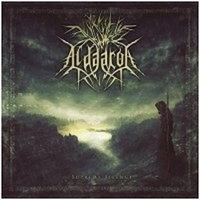 With all song titles in their mother tongue the French black metal band Aldaaron take a huge step towards the top of the black metal universe. Their second album, Supreme Silence, is a fantastic well-written study of black metal with brutality and elegance they offer their fans on their new CD. 6 songs may not seem so much, but the quality of the material is outstanding on its own. Renegat opens the gate and as soon as the stormy intro of nature elements passes the aggressive growls takes this melodic black metal masterpiece into the drivers seat. La Legende Des Fils continue their brutal style, but the depth in the songwriting leaves no doubt of the high class Aldaaron finds this great balance in the songs. Jatteindrai La Purete is pushing the limits a bit further of how a melodic black metal hymn should sound, fantastic composition where everything succeed for Aldaaron. The title song Supreme Silence is a very elegant example of dedicated black metal where the drums lay a massive foundation to their victorious way to create music which is both complicated and stylish, Supreme Silence is much more than meaningless grumbling growls, it is wise and done with class and feeling.